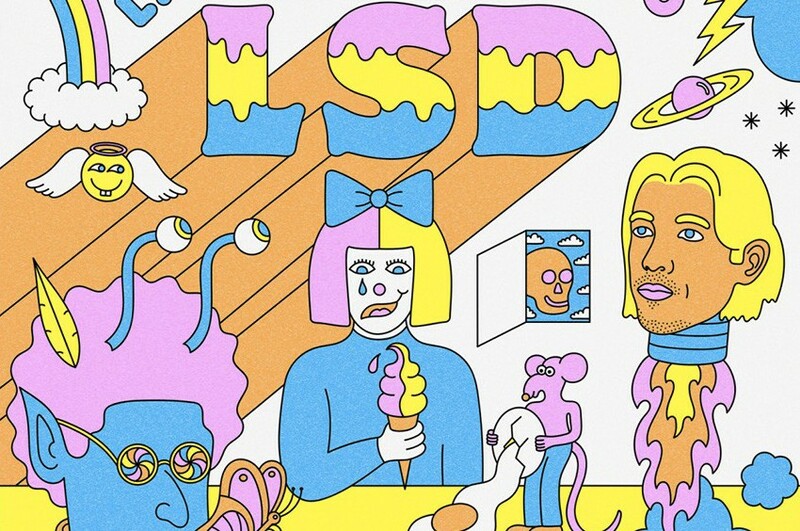 Supergroup LSD released their long-awaited debut album “Labrinth, Sia & Diplo Present... LSD” on April 12th. On the same day, the trio premiered a new music video for “Audio” from it, directed by Ernest Desumbila. LSD is composed by British musician Labrinth, Australian singer-songwriter Sia and American music producer Diplo. The trio was formed in 2018. Diplo stated, "Originally, I wasn't in [LSD] and then our publisher had the idea to throw me in there; those two artists, together, are two of the craziest, most creative people I ever met in my life. I think they have the most severe attention deficit disorder together, their ideas are so crazy, so I helped put their ideas together, taking the job of their producer." The album comprises of 10-track including Lil Wayne's remix version "Genius". Originally, the album was supposed to release last November, but it was pushed back to April 2019. "When we got the chance to do LSD, we jumped at it, and it’s one of the most creative projects I’ve been involved in," Labrinth recently told The Rolling Stone. "We dress up in crazy outfits, mess around with Sgt. Pepper’s-esque visuals; we’ve created animations for the band. You can be ballsy and be out there. It feels like you’re not the frontman, so it allows us to go as crazy and as fucked up as we want to go. And that works for us."